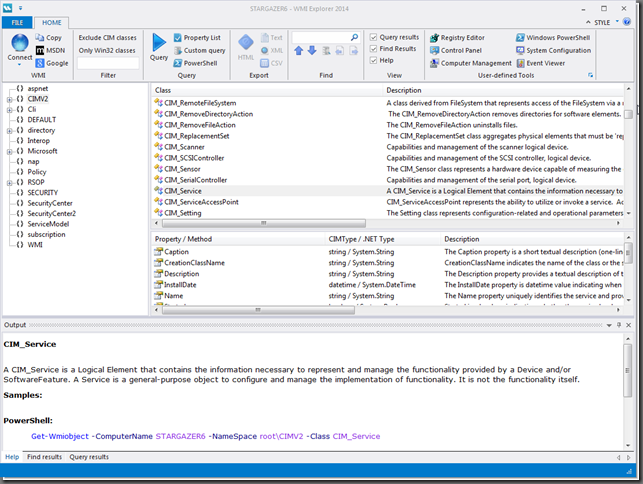 WMI Explorer 2014 is now officially released as of April 17th 2014. Please go here for more details. For many years now administrators have used SAPIEN’s WMI Explorer to get a handle on WMI classes and their properties and methods. It is in fact one of our most popular free tools from our collection of community tools. Amazingly enough this was never a tool that was intended to be released to the public. I originally put the WMI Explorer together in 2005 from code I found online and had laying around to better understand WMI and how to query the huge database behind it. So it is admittedly a bit of a Frankenstein, but nonetheless it seems to have helped many administrators to do the same thing I needed it for: Discover WMI. Fast forward to 2013. I had a conversation with Jason Helmick about what tools administrators use and need. During the course of our conversation he brought up the WMI Explorer and how he encourages students to use it and find out about WMI classes and their properties. I was actually a bit embarrassed that something I just hobbled together was in such widespread use. So I set out to build a better mousetrap and started needling Jason with questions about what was good, what was bad, what was missing and so forth. Lucky for me, the guy has endless patience and a passion for this kind of stuff, so he kept answering my endless stream of inquiries. Performance. The original version is slow. The new one is not. It’s C++, caching information, multi-threading and just plain blazing fast. Some queries are still slow. Blame WMI, I can’t do everything myself. Query other computers. The original could only use your local machine. The new one takes your credentials and stores them. Reconnect at your leisure. Even better, everything but the actual data is cached, so after the initial connect you can browse and search a server’s WMI classes and properties without having an actual network connection. So you can help your junior admins back at the office while you sip your latte at the airport. Search. The original WMI Explorer had no search. Period. This is one of the items in this new version I spent the most time on: Finding things. There are three different ways to find, filter and search in order to accommodate everyone’s individual style of finding what they are looking for. Queries. The first version had no way of running any kind of query. Now you get property lists, tables with property columns, custom queries and you can export the results in four different formats. Last but not least, this one is not built for me. It is built for you. So go and download the preview (links are at the end) and try it out. Let me know what works and what doesn’t. You can post in our free tools forum about anything you care to share. I will post a few more articles with some more details in the near future so please stay tuned and read our blog. Below are the links to download this time limited community preview. This version will expire December 31st 2013. Very nice. I so LOVE have a search function!! Thanks! The wonderful aspect to the previous version I was using was that it was portable and did not register in Add/Remove programs. This new version registers in Add/Remove. This makes it difficult to use in a secure environment.